In this tutorial, we're going to make an animated double rainbow in HTML5 / Canvas. I'm doing this to teach you about the HSL color space, and to show you a more sophisticated way of using it. There is also a version of this tutorial with the same examples written for Processing.js or Processing. There are tradeoffs using either system, but for the most part, it's a bit easier in Processing. Note that if you are using an ancient and terrible web browser (IE8 or earlier), you won't be able to see the examples! 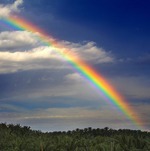 To draw a rainbow, we need a graphics framework to work with. In this tutorial, I'm going to draw everything using the Canvas APIs which are part of HTML5. This means that if you are using an older web browser, like IE 8 or earlier, you're not going to see anything! All the examples I'm using make use of the same basic skeleton code, which sets up a simple canvas and draws in it using its device context. You can download this skeleton, here, and use it for your own experiments. To draw in the canvas, I will place the code in a routine called refresh, like so. The refresh routine accepts as parameters the device context (dc) of the canvas, the width of the canvas, and the height of the canvas. Click on my examples to see the contents of my refresh() function. For the occasional animated example, I will use a slightly modified skeleton that also passes in a frame number, like so: (You'll find an additional piece of sample code for doing animations in the above archive). Although I have supplied you with the skeleton code, you'll learn more if you attempt to build it from scratch yourself, using an HTML5 canvas reference. We'll start by making a rectangular bar, which is colored like a rainbow. To do this, I'm going to draw a series of lines of different colors. I'll start by just coloring them randomly, using the random number generator. You may be familiar with specifying colors in CSS using a specification like '#FF7F00', in which the R, G and B components are specified in hexadecimal. The rgb style allows you to get the same color using 3 decimal numbers (one for red, green, and blue respectively). So instead of using #FF7F00 you would say rgb(255,127,0). Since those CSS colors are supplied as strings, this function allows me to construct it from individual numbers. This is pretty straight-forward. It is passed a device context (dc), a CSS color string, and the line coordinates. It sets the color, creates a path for the line, and then strokes the color along the path. Finally, we get to the part of the code that draws the bar. The bar is made up of 1-pixel lines. First I set up the coordinates of the top left edge of the bar, which are specified by left_margin and top_margin. Then I set the width and height of the bar. Finally, I draw each line, from top to bottom, in a for-loop. As the for-loop executes, the variable i takes on the values 0,1,2,3... all way to the height of the bar. This variable is used to set the Y position for each line. Now, in a rainbow, the colors aren't random, so let's take the randomness out. I'll change the loop so that the colors go from black to red. The red color is produced by multiplying the ratio by 256, and then using Math.floor() to convert it to an integer. Since the ratio never quite hits 1, the color value will never hit 256 (which is good, because the RGB color components are supposed to go from 0 to 255). Hue is a degree value that goes from 0 to 360. It starts red, then goes through all the colors of the rainbow, and then comes back to red. Saturation is a percentage value from 0 to 100% which tells how colorful the color is (from grayscale at 0, to fully saturated at 100%). Luminance is a percentage value from 0 to 100% which tells how bright the color is (from black at 0, to white at 100%). Note that in this color model, extremely dark and extremly light colors aren't very saturated. If you use 100% for luminance, the color will look white. To get extremely bright and saturated colors, use 50% luminance. Here's a function to make hsl() strings from numbers, similar to our rgbColor() function. And here's a gradient which uses a ratio to walk through the available hues, drawing the brightest colors possible. Things are starting to look a little rainbowy, no? This is accomplished by changing our line function to an arch function, and changing our loop to draw each line of the arch. When I first did this, it produced some white pixels (moire artifacts) because the curves didn't line up exactly. I fixed this by doubling the line width of the pen. Let's take a break, we've accomplished a lot! Now let's do some more work on the background. It would be nice to have a gradient in the sky, just like we have in the rainbow. We could draw a bunch of lines again, but there is an easier way -- we can use the HTML5/Canvas gradient functions. At this point you might be wondering if it's possible to use a createRadialGradient() to draw a rainbow and simplify our code. Yes and no. I tested this, and it turns out, it doesn't make the code much shorter. This is because these color gradients interpolate between RGB values, rather than HSL values. You can't set two color stops and get it to cycle through more than two hues. This means that to create the rainbow effect, you have to incorporate 7 or more color bands (using the addColorStop function) in your gradient. The loop that creates those color stops looks very much like the loop that we are currently using to draw our arch -- so the code is roughy equivalent in complexity. If you're curious here's an example that makes a rainbow using a radial gradient in 7 bands. I won't use this method further, because it limits the kinds of effects we can do. For example, if we wanted to draw an unusual rainbow shape, such as a spiral or figure-8, we would run into problems using a radial gradient for the shading. Oh, in case you haven't seen it, here's my tutorial on drawing circles, spirals and sunflowers. If you are in the Los Angeles area, I'll be teaching a couple of graphics and music programming workshops in Culver City, using the Processing language, in the next few weeks. More info here.